Peter J. Tomasi and Doug Mahnke continue their Countdown to #1000 with another bout of mystery and murder as Bruce attempts to hone in on his new suspect in the killing of Leslie Thompkins and attack on Alfred Pennyworth. 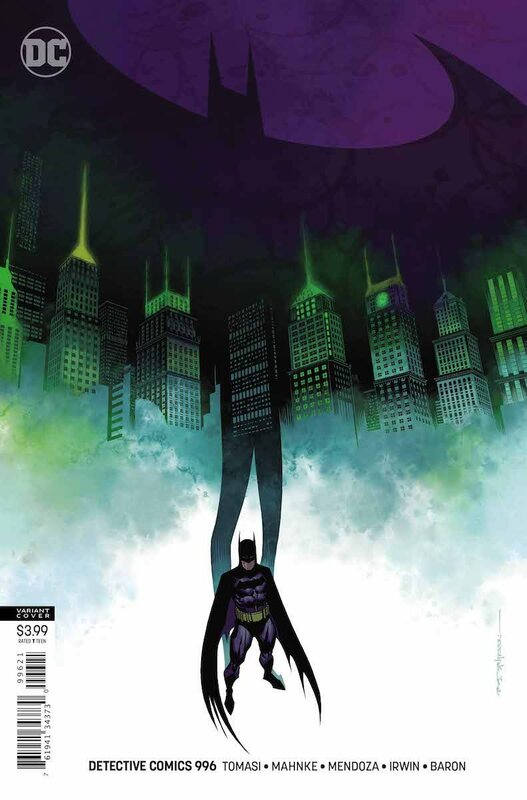 Those familiar with the other lines of current Batman comics will continue to find this new teams’ take as having a very different overall tone and what some may consider an opportunity for the “worlds greatest detective” to do some actual detective work again, rather than it being a character piece drenched in pathos and immersed in unraveling what makes the Bat tick. But, while this change could be a welcome alternative to the other main Bat books, this issue proves again that the run has yet to find its footing. The threat following Batman and hunting those in his personal life, as shown in issue #994, is some sort of raged filled, shape shifting homunculus creature. In the first issue it was unclear what its or its creator’s goal is other than the immediate destruction of people at some point important to Bruce Wayne. Three issues in and the story is still hovering around that bit of information, having again shaken the tree of Batman comic history to see who falls out and how hard. While its fun to see these early, formative characters make appearances, I can’t help but feel like more time with them would feel more justified and help them feel more significant to this story. There’s a notable difference in characterization of Batman in this book that betrays what we’ve seen out of the other more recent Batman runs, and that being just how talkative our brooding Dark Knight is. At nearly every opportunity to speak, this Batman is shown heavily taking advantage of it. His word balloons are info dumps of plot recounting or justification. While I’m sure that bringing up some of these characters again may require a jostling of the reader’s memory to get the most out of the plot, it is generally taking away much of the tension in these seemingly tense character moments. The art is good. Mahnke is a great character artist with designs reminiscent of early early-mid 2000’s superhero romps. The action sequences here are hard to follow at times though, with panel layout obfuscating much of the actual contact and choreography. The line work is still impressive regardless, though Damian doesn’t quite look himself or his age. Overall, we still have a decent Batman book here, and there’s still plenty of time for them to hit us with some crazy twists on our way to issue #1000. With how this issue ended and whom they are likely to bring into the mix, I have high hopes that we’ll see something special in the coming issues. Oh yes, I’m still on board, despite the fact that classic Batman characters seem to be rushed in front of the editorial crosshairs.